Yesterday the Hooked app was proud to be Mashable’s featured “App of the Day”. In just hours after this Hooked highlight, the application received thousands of new downloads and users thanks to Mashable’s unique following. Since it’s founding in 2005, Mashable has quickly become a leading platform in detecting the latest trends in the world of technology and digital culture. The news outlet and blog has a clear goal of bringing fresh, newsworthy information to its audience of 45 million monthly unique visitors and 25 million followers on social media. In its over ten years of operation, Mashable has seen incredible success and holds a major influence in the social networking and tech sphere. Hooked is thrilled to be recognized and celebrated by a powerful network such as this one. We started as just a couple of college students that were fed up with the process and cost of going out to grab a bite and have now developed the #1 food and drink app in college towns nationwide. In just 5 years, we have reinvented the way our over 500,000 users decide on where to eat, drink, and socialize next. We have partnered with over 1,500 of the top restaurants in our 38 cities to offer users exclusive deals. Most importantly, Hooked has created a loyal community of food and deal lovers incorporating the app into their daily routine. Here at Hooked, we do get it. That is why we are never done tackling new adventures and striving to reach our full potential. 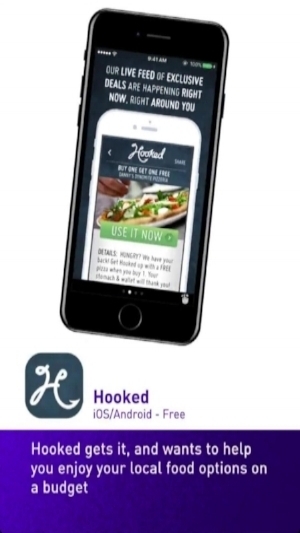 Being highlighted by Mashable is just another milestone towards fulfilling Hooked’s ultimate vision. Stay tuned for more on Hooked’s journey.